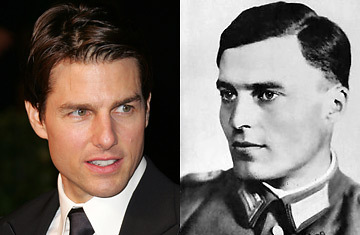 Tom Cruise and German officer Claus Schenk Graf von Stauffenberg. The furor says more about Germany's struggle with Scientology than it does about the actor, who does, it's worth noting, bear a passing resemblance to the square-jawed German national hero. Cruise was offered the role, says United Artists CEO Paula Wagner, "because [director Bryan Singer] thought he was perfect for the part. Aside from his obvious admiration of the man he is portraying, Mr. Cruise's personal beliefs have absolutely no bearing on the movie's plot, themes, or content." The German authorities have had a long history of run-ins with the Church of Scientology, which they accuse of masquerading as a church in order to make money  a charge the group vehemently rejects. Germany, along with several other European countries, has aggressive laws targeting groups that they deem to be cults. Their hostility to Scientology is also based, Cabreta told TIME, on a perception that the writings of the church's founder , L. Ron Hubbard, split the world into "social " and "anti social" personalities, and also that the group "propagates the idea that Germany is controlled by Nazis." The German government recently tried, unsuccessfully, to prevent the Church of Scientology from opening a new 43,000-square-foot headquarters in the upscale Berlin district of Charlottenburg. The facility opened in January, and Cruise and his wife, Katie Holmes, dropped by earlier this month during a visit that also took in the Von Stauffenberg memorial. The memory of von Stauffenberg is close to German hearts. His plot to assassinate Hitler on July 20, 1944, while unsuccessful, has come to symbolize German resistance to the Nazis. Repelled by Hitler's racist policies and military bungling, Von Stauffenberg tried to blow him up with a suitcase bomb at the field headquarters known as Wolf's Lair, but the blast was partially obstructed and failed to find its target. Von Stauffenberg was executed in a purge shortly afterwards. Casting Cruise in the role has drawn fire from a range of sources. "He should keep his hands off my father," Von Stauffenberg's son Berthold told the Suddeutsche Zeitung. "He should go climb a mountain or go surfing in the Caribbean. I don't care as long as he stays out of this." Von Stauffenberg said that he was not commenting on Cruise's acting prowess, though based on the star's oeuvre, he feared the result would be "terrible kitsch." German actor Thomas Kretschmann (King Kong, The Downfall) told the Welt am Sonntag that Cruise's selection "an absolute catastrophe, a real blow." He said the very idea of this "epitome of modern American action cinema" putting on a German uniform with an eye patch is "quite ridiculous." The furor is unlikely to have any impact on the movie. Entitled Valkyrie and directed by Bryan Singer (Superman Returns), it is still scheduled for release in 2008. The Defense Ministry refusal to allow access to its buildings will bar cameras from the original cluster of rooms, including von Stauffenberg's office, where the plot was hatched, though presumably the setting can be replicated at studios outside Berlin. The German government action seems unlikely to cost Cruise his role. The publicity, if anything, will probably boost ticket sales, even as Germans find comfort in having spoken out: "I am very glad that the filming permission for such a high-ranking Scientology member could have been prevented," a senior official in the ruling Christian Democratic Union party, Antje Blumenthal said. "This would have equalled an acceptance of Scientology." As the world now knows, Germany is having none of that.